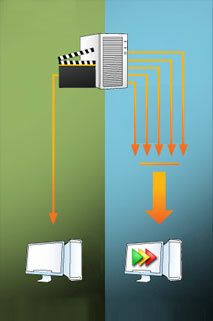 featured in Video Accelerator's latest release - 21 December, 2009. SPEEDbit announced today the release of SPEEDbit Video Accelerator 3.1, the latest version of the revolutionary application that lets users watch web videos without frustrating buffering pauses and freezes. The new version includes built-in integration with Twitter, support for Google Chrome, and other enhancements and improvements. SPEEDbit Video Accelerator crosses 20 million installs - 29 October, 2009. SPEEDbit Announces the release of SPEEDbit Video Accelerator 3 - 14 July, 2009. Video streaming on the web today works generally at 50% efficiency, SPEEDbit has found. SPEEDbit Video Accelerator on average doubles and in some cases quadruples the streaming speed and throughput from sites such as YouTube, resulting in a smooth viewing experience with no picture freezes. and 14 million installs of the PC version of the application - 27 April, 2009. Released only two years ago, the 14 million install milestone demonstrates the surging popularity of this unique application. Now, SPEEDbit is bringing the revolution of accelerated web videos to new platforms, with the Mac platform being the first.